One of the significant differences is in navigation. 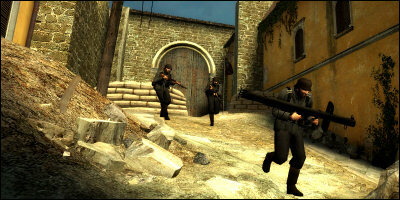 In Counter-Strike, the player typically advances somewhere in stages, taking cover when necessary and/or camping wide-open areas. There is a lot of waiting and sneaking around, often on only a couple of planes. Day of Defeat, on the other hand, requires (and encourages) a lot more movement. Once one flag is taken, you have to keep moving to survive (and win.) You have to keep an eye out for snipers much more than you do in CS, and the maps are typically tighter, denser and make greater use of height and multiple planes. With CS mapping, you can afford to skip a few brushes here and there to force the player to jump over obstacles and slowly make progress through difficult bits. DoD is the opposite: you have to pay extra attention to edges and details, to make absolutely certain the player won’t get caught, or even just to help them slide through some of the smaller, more detailed areas. With CS, the player can afford an extra few milliseconds to work out where they’re going to go next. With DoD, their exit has to be immediately apparent. In addition, DoD has so much rubble and half-destroyed buildings that not only must the collision be neat and tidy, but the player has to realise which areas are passable and which areas are not. There are so many small, tight interiors that they all have to be fairly unique to stop the player getting lost. This is true all multiplayer maps for all games: wherever the player is, they should be able to work out exactly where they within only a second, simply by looking at whats in front of them. In this respect, DoD is a lot more like conventional Quake DM mapping - keep it tight, enclosed, and oil the walls. It’s a very fast game (especially compared to something like BF2, or even CS) and visually vibrant, making it a lot harder to design maps for, especially fun ones. In a DoD game, the last thing the player wants is to get lost or caught on a table. The key really is to avoid unneeded detail and keep paths clear and concise.